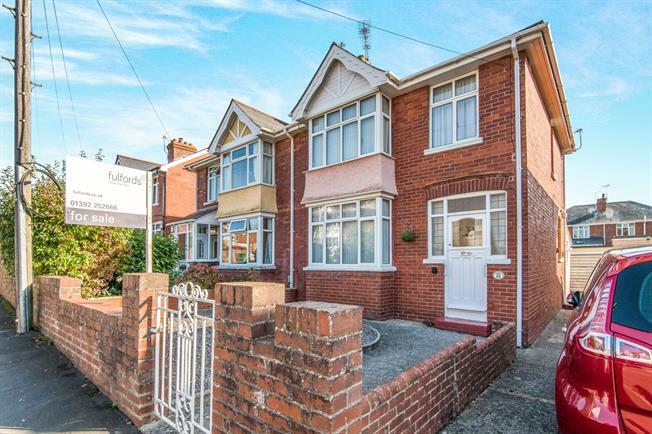 3 Bedroom Semi Detached House For Sale in Exeter for Asking Price £325,000. A fantastic opportunity to own this bay fronted, semi-detached family home in the heart of Heavitree. Comprising of a separate lounge and dining room, sun room, good size kitchen/breakfast room and WC. To the first floor is the shower room and three good size bedrooms, of which two have built in wardrobes. Outside the property is a shared driveway, garage and good size rear garden with a shed. Some original features still remain, including the wooden front door with stained glass and upstairs internal doors. Also benefitting from gas central heating. Original wooden front single glazed door with stained glass. Radiator, carpeted flooring, under stair storage, ceiling light. UPVC sliding double glazed door leading in to the sun room. Gas fire, carpeted flooring, ceiling light. Double glazed uPVC window. Vinyl flooring, ceiling light. Roll top work surface, fitted, wall and base and drawer units, stainless steel sink, gas oven, electric hob, space for slimline dishwasher, space for washing machine. UPVC sliding double glazed door, opening onto the garden. Vinyl flooring, wall lights. Single glazed wood window with obscure glass. Vinyl flooring, wall lights. Low level WC. Double glazed uPVC bay window facing the front. Radiator, carpeted flooring, built-in storage cupboard, ceiling light. Double glazed uPVC window facing the rear overlooking the garden. Radiator, carpeted flooring, built-in storage cupboard, ceiling light. Double glazed uPVC window with obscure glass. Heated towel rail, vinyl flooring, ceiling light. Low level WC, double enclosure shower, pedestal sink, extractor fan.